Bryce Mann is one of the older twin brothers in the Rock Band “Rebelmann” from Chicago. REBELMANN® is exactly what the trademarked name implies: REBEL – MANN. The teen rock band sensation from Chicago consists of siblings Clayton Mann, and his twin brothers, Johnathon and Bryce Mann. Music is obviously what they do. Schooled in the arts from a very early age; the Mann brothers have combined training on piano, viola, cello, bass guitar, guitar, and drums. All three brothers played in their school’s orchestra, and remain schooled in music today. 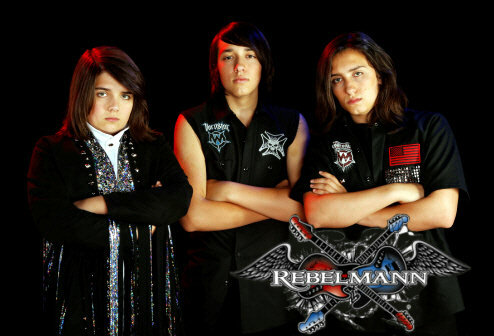 It is with this desire to play “real” music, that the Mann brothers chose the name of their band – REBELMANN® . The name “REBEL” because they play “real” music, no computers, no backing tracks, just live music; and “MANN,” well because that is obvious. In addition to their band name, all 3 brothers helped design their trademarked crossed-guitar logo. With the clashing lefty and righty guitars, the broken strings represent the brother’s hard-hitting sound of rock ‘n roll. Johnathon added the ‘electrical sparks’ around the guitars, Clayton the barbed wire, and Bryce the wings as a nod to the history of rock ‘n roll. And then there’s Gene Simmons, the iconic bassist and founder of the megaband, KISS. Would you ever believe a headline to read like this? Yes, Clayton Mann pulled that one off too! It’s all good with Mr. Simmons. REBELMANN® attended the Rock Fantasy Camp in Las Vegas where they met the iconic bassist, along with former KISS guitarist, Bruce Kulick, who now mentors the young band of brothers.